The Man From U.N.C.L.E. finally arrives on DVD on November 27th in a huge complete series briefcase. Airing on NBC from 1964 to 1968 there were 105 U.N.C.L.E. episodes. Some of the early development of the show was done by Ian Fleming who famously came up with the main character’s name, Napoleon Solo which derives from Goldfinger. Some of Fleming’s handwritten notes on the show which includes plots and characters will be included in the DVD’s bonus features. 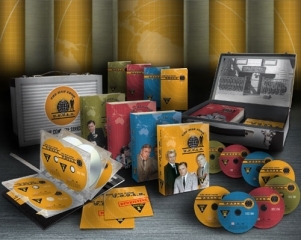 Among numerous other bonus features, the DVD set will include new commentary by Robert Vaughn and David McCallum. Nov.27.07 » The DVD From U.N.C.L.E.